Maybe your downward dog could use a little work. Or perhaps the angle on your back foot in warrior pose is just a little bit off. 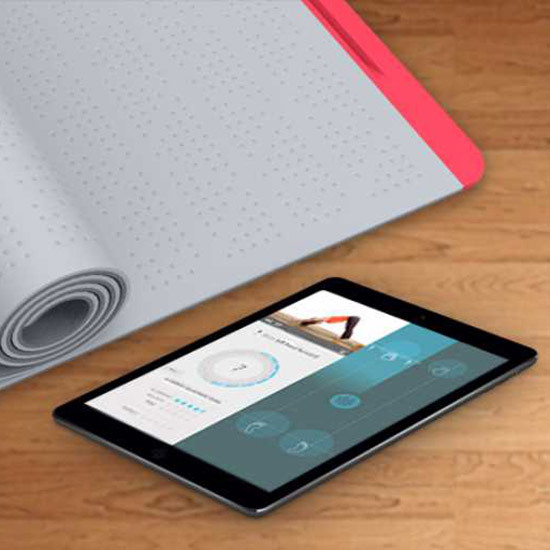 The solution to your yoga woes might be the SmartMat, the first Bluetooth connected yoga mat that tracks your movement and provides feedback to take your practice to the next level. The creators of SmartMat launched an IndieGoGo campaign today to help fund this yogic enterprise, with an end goal of $110,000 raised. Perfecting your zen doesn’t come cheap: The mats are being sold at $297 each for “early contributors,” and will eventually retail for $447. They look and feel like a classic yoga mat, but at seven pounds contain all the artificial intelligence necessary for tracking your every move. Though we haven’t had the opportunity to try a SmartMat IRL, we know how it works: You download the SmartMat app for iOS or Android on your tablet or smartphone, and it links up to the mat via Bluetooth. When you first activate the mat, the app will ask for some basic information like gender, height, and weight to help with the custom calibration. The app then provides guided instruction for a personal, private yoga practice, and reads students’ movement and offers audio/visual corrections throughout. It’s also possible to roll up the mat and bring it to a class setting. In class you can either switch it into in-class-assist mode, which offers help visually or audio through headphones, or zen mode, which tracks progress for later review. It seems like an unlikely pairing, sophisticated technology and yoga, and it’s natural to imagine a quiet room painted in earth tones with Pure Moods playing in the background. But for Neyma Jahan, one of SmartMat’s cofounders, the two have actually existed in harmony for some time now. Despite the fact that the SmartMat was developed with help from a team of yoga teachers led by Amy Lombardo, a 15-year yoga vet, some other teachers are skeptical about the idea. And though they have yet to try it, the overall concept gives them pause. “I can see how this might be a fun addition to an already experienced yoga practitioner's practice, when they are traveling or can't make it to class. However, I definitely do not think the mat is a substitute for in-class or private instruction,” New York-based yoga teacher Joanne Silver told the Daily Dot. Silver offers both private and group instruction, and she has a hard time imagining such a device fitting into either setting. Lisa Bermudez, another New York-based yoga teacher, agrees that this sounds like a product best-suited for upper-level yogis, and fears it could be dangerous for newcomers. She points out that although SmartMat tracks your alignment, it may not be able to read transitions between positions, where Bermudez says most injuries occur. Though Silver and Bermudez are far from representative of the views of all yoga teachers, they were pretty much unanimous in their disdain for this idea. And Silver feels the idea of checking students’ alignment on an iPad or other device totally contradicts the idea of a yoga group class. She adds that it could help yoga students take responsibility for their practice, remain focused in class and stay committed to achieving excellence and reaching benchmarks. Skeptics need not fear the imminent threat of the SmartMat: The aforementioned “early adopters” won’t be receiving theirs until approximately July 2015. But we hope to get our hands on one before then to truly test the merits of something that is either totally superfluous or we totally can’t live without.